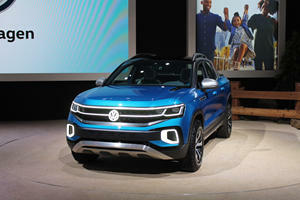 Volkswagen’s massive seven-seater Atlas is the brand’s new SUV designed and built for Americans, by Americans. It has everything going for it to be a US hit, size, space, a 276 hp 3.6-liter V6, and a ten-model lineup. It’s cheaper than a Touareg too with just $30,5000 getting you in on the action. Is the Atlas going to renew US faith in the brand? 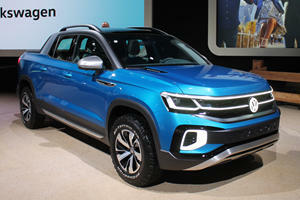 The aptly named Atlas heads up Volkswagen’s attack on the American SUV market. This new model aims to do better than SUVs the automaker has previously sold in the US, and considering it’s massive size and the fact that it was designed solely with the American market in mind, it promises to do well. VW has put 10 model variants on showroom floors to make sure it’s snapped up, and with seating for seven linebackers and their full kit, a great powerplant and decent pricing, there’s really no reason why it’s not going to outsell the Touareg and Tiguan by far. This should be Volkswagen’s most successful SUV in America. With a length of nearly 16 feet coupled to a rather square-ish exterior design, you can imagine what the space is like on the inside of the new Volkswagen Atlas. There’s a lot of it. There’s more than in anything that sells alongside the Atlas. Every space measurement is class leading, most notably the 97 cubic feet of space when the seats are folded down. Seven seats are standard fare and are arranged in a layout that includes a three-seat second-row bench with a two-seat third row. The interior appointments are good, there are some plastics that look cheaper, but overall it’s close to Audi quality in fit and finish. The driving position is high making for great all-round visibility and everything the driver needs to operate is in easy reach with, ergonomics are surprisingly good. The optional digital speedometer couldn’t be better, it looks really good and lists all information the driver could possibly need. 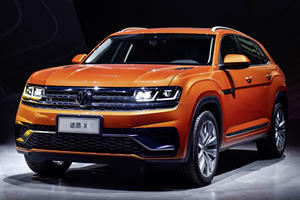 Driving vehicles with a large size like the Volkswagen Atlas can sometimes be a pretty daunting task, but the way this new car is based on the popular MQB platform, the engineers involved have managed to make the drive feel more like a Golf than a truck. With it’s great bulk there’s still some body roll thanks to physics, but the drive is smooth and refined, but solid enough to make the driver feel like he’s always in control. The V6 powering the Atlas’s four wheels is enough to get it going forward, but you have to keep in mind that it’s large, and when fully loaded will rival the Titanic in weight and that makes the engine feel like it needs help sometimes. Hopefully the upcoming 2.0-liter for the planned front-wheel drive variant is pushing out some good numbers because that model promises to be a decent and affordable option. 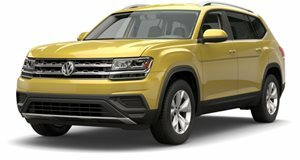 The monstrous Volkswagen Atlas comes from the Tennessee assembly plant fitted with a new 3.6-liter V6 that makes 276 hp and 266 lb-ft of torque. If those numbers look a little on the small size for something the size of an Atlas, you’re right. They could definitely be higher, especially when there’s also an all-wheel drive system sapping power. With a foot flat on the floor, the Atlas takes a calendar month to get to 60 mph, 7.9-seconds to be exact. Trying to force performance also affect fuel consumption with a claimed 23 mpg on the highway and just 17 in the cityscape. The 8-speed automatic is brilliant though. With ten models on offer (nine so far), and the way new cars can be configured, there are almost too many options to be able to list. That said, things are quite simplistic in the Atlas. The Fender audio and infotainment system is great; it’s the same user friendly system found spread across the brand’s top models. The digital cockpit is really good with perfect contrast, and all the right info available. Active safety includes all the usual acronyms while options available are the Intelligent Crash Response System and the Tire Pressure Monitoring System. For fans of the brand who have been disappointed in the offerings in the past, the new Volkswagen Atlas will have them thinking the opposite now. It has the right dimensions inside and out, features a very good motor, gearbox and drivetrain and has all the right appointments to make for a comfortable drive. Starting at an affordable $30,500, the German family SUV should be the brand’s bestseller yet in this class.